Enjoy an afternoon picnic with your family and the PLAYMOBIL Family Picnic Carry Case. Spread out the blanket by the shade of a tree, and enjoy an afternoon snack of apples, biscuits and yogurt. Don't forget to feed baby! Play with the doll, teddy bear, balloon and rattle, and stroll around the park with the stroller and child's bike. Let your imagination play! 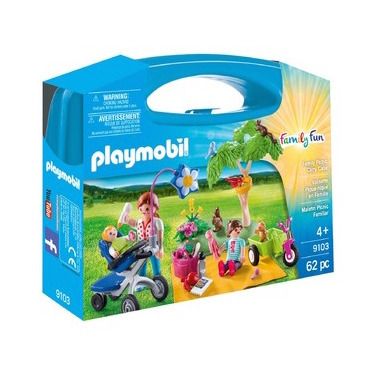 Playset includes one adult figure, one child figure, one baby figure, stroller, child's bike, blanket, bag, apple, pack of biscuits, yogurt pot, spoon, tree, flowers, squirrels, birds, teddy bear, doll, balloon, and lots of other accessories.